Our Vanilla essence based incense sticks release soothing fragrance that brings out the freshness of early morning. Each of our Vanilla Incense Stick is prepared as per the traditional methods giving immense preference to purity. The enchanting fragrance exhibited by our Vanilla Incense Stick will surely give you a heavenly experience which is difficult to get from elsewhere. Made from aromatic flowers and superior ingredients, our Incense Sticks burn for longer period of time. Apart from this, we also focus on air-tight packaging for the sticks that helps to retain its fragrance consistently. These Vanilla fragrance incense sticks are demanded by aromatherapy centers, spas, and various health care institutions. 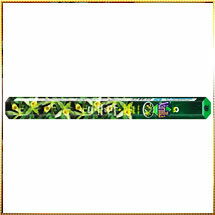 We provide good quality Vanilla flavored Incense Sticks at the reasonable market leading prices.